Discover MilitaryByOwner's Latest Site Updates! You know that MilitaryByOwner Advertising's mission is to provide support to military families looking to sell, buy, or rent a home. We accomplish this through various ways, including advertising packages to list your home for sale or rent, free browsing of advertisements on our website as you search for a new home, and providing lifestyle support for you and your military family through our regularly updated Blog and series of Ebooks. While our website is equipped to handle your advertising needs, we're always working on ways to make it even better and easier for you to use! Earlier this year, we released our updated iPhone app for the ease of our mobile users. Two months ago, we updated our user-friendly company blog format as you browse and search for posts of interest. Most recently, we updated the MilitaryByOwner site, making it for easier for users when including photos with their advertisement. Check out MilitaryByOwner's latest site features! 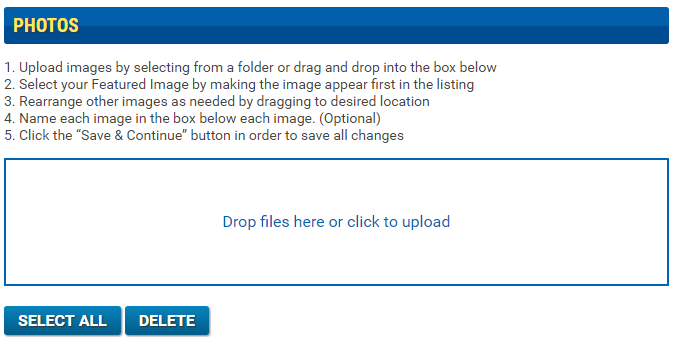 Photos can be easily added to your advertisement now by dragging and dropping or by simply uploading from your computer file. Multiple photos can now be added to your advertisement at the same time when you drag and drop. Note that horizontal/landscape photos work best for the photo space provided. Larger photos will now automatically resize to the photo space. However, a very small image will look blurry or grainy if enlarged to the photo space, so be sure to choose your photo accordingly. The photo in the first space will be the primary photo of your advertisement. This is the photo that will appear on the base home listing page and make the first impression to our browsing audience. Each photo can now be labeled. For example, you can add a caption under each photo explaining the use of the room and/or dimensions if you so desire. 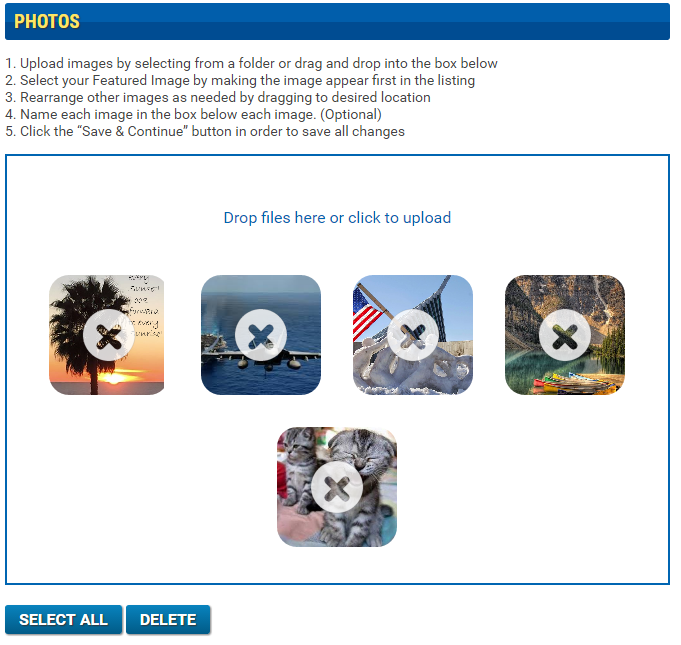 You now have the freedom to rearrange your photos by moving your cursor over the blue lines at the top then sliding the photo to the new space. Upgrading Your MilitaryByOwner Ad Is a Cinch! 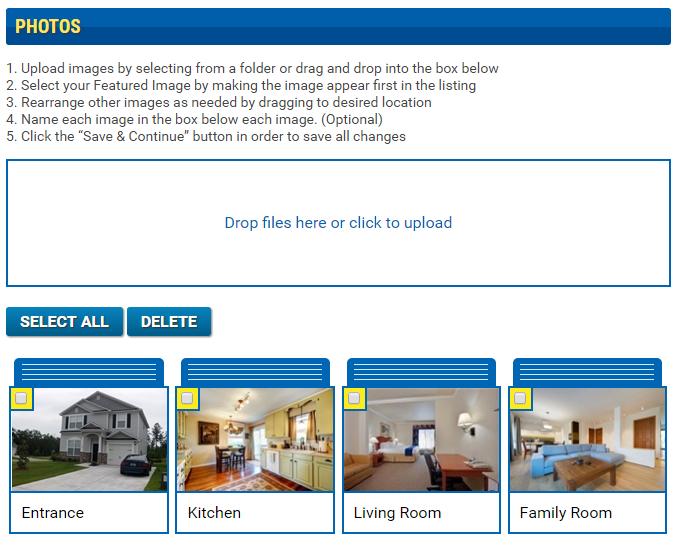 If too many photos are uploaded for your advertisement package, Home Tour (5 photos) or Home Tour Plus (40 photos), an "X" will display on the extra photo or photos. At this point, you can decide which photos your advertisement can do without or consider upgrading your advertising package to accommodate your featured photos. If you have any questions as you begin creating your new MilitaryByOwner advertisement, please do not hesitate to contact our customer service. Our team is prepared to help you successfully advertise your home and happy to do so!